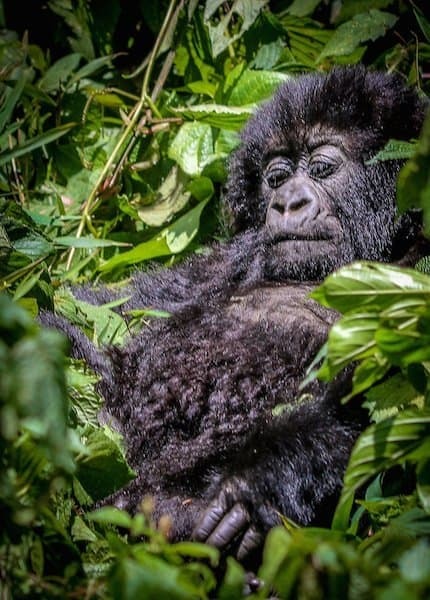 Aside from being pronounced man and wife and being told I have a healthy baby girl, this sentence uttered by our gorilla trekking guide, Francois Bigirimana, is arguably the most exhilarating I’ve ever heard. And it’s just the beginning of our magical hour with a family of Mountain Gorillas in Rwanda. As we round a corner in the dense bamboo forest in Volcanoes National Park, we get our first glimpse of the 13-member Sabyinyo Gorilla Group. Entering a small clearing, I see a 10-month-old baby Gorilla feeding with his mother atop a thicket 20 feet away. He stays close to his mom at first, cautiously eyeing our group of trekkers and trackers. But the sound of clicking cameras draws his curiosity. He crawls closer and closer, pounding his tiny chest in an adorable display of baby bravado. “He’s saying, “I’m going to be the big boss someday! '” Francois explains. This sort of up-close encounter would be impossible were it not for the groundbreaking work of Dian Fossey. The legendary primatologist came to the Virunga Mountains with very little field experience in 1966. Back then, the Mountain Gorillas were wild; their only prior human contact having been with poachers. Enduring temperatures below 40ºF, carrying gear on their backs, and traveling through thick vegetation and mudslides, Fossey and her team established the Karisoke Research Center in a valley at 12,000 feet between two volcanic peaks—Karisimbi and Visoke. By mimicking the gorillas’ sounds and body language, Fossey gradually habituated these gentle giants to her presence so she could observe their daily lives closely. She also created “Active Conservation” tactics still used today, destroying traps, enforcing anti-poaching laws, taking population census counts, and lobbying for the expansion of protected habitat. Without Dian Fossey, Gorillas would likely be extinct today. 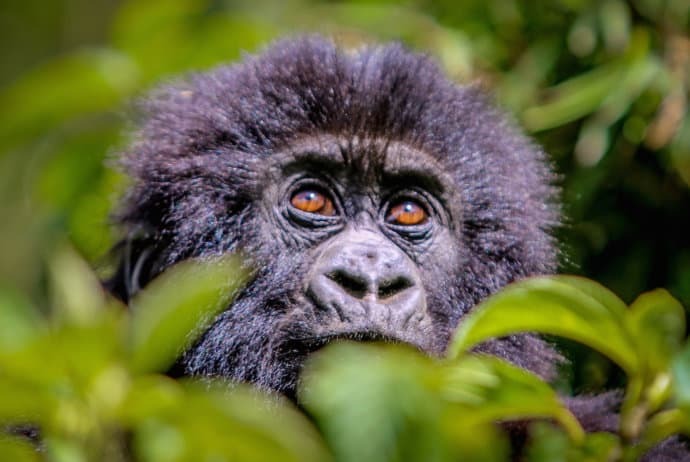 Instead, the number of Mountain Gorillas in Rwanda is growing, with about half of the world’s total population of around 900. We met up with Francoise and his team of trackers and porters at sunrise at the Volcanoes National Park Visitors Center. 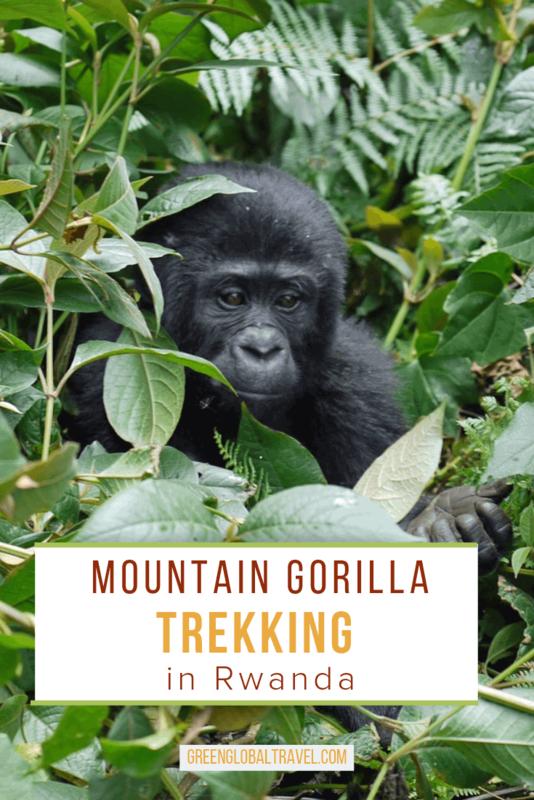 The area was bustling with activity: A traditional dance troupe entertained the trekkers while guides gathered in a circle to determine which of us would visit each of the parks’ 10 habituated Mountain Gorilla groups. 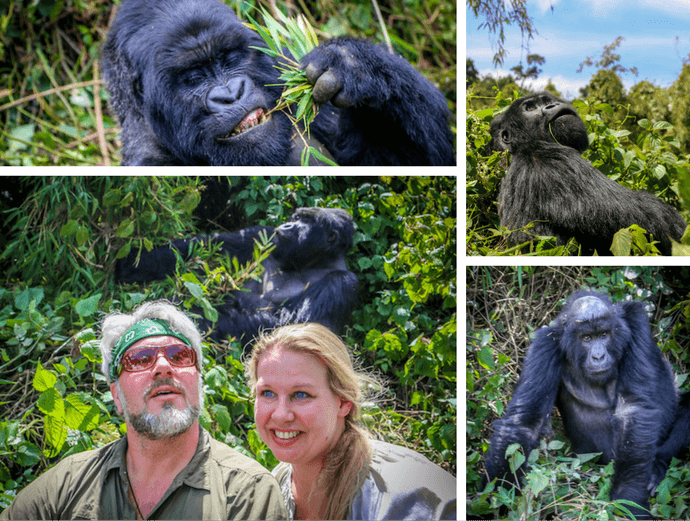 We’d heard about Francoise the previous day from a couple staying at the Mountain Gorilla View Lodge, an eco-lodge located 10 minutes from the park’s entrance. They told us how entertaining he was, and that he’d worked as Dian Fossey’s porter back in the ’70s. Thanks to Arthur, our Thousand Hills Expeditions guide, we managed to land spots on Francois’ 8-person tour group. Francoise is a natural born entertainer. He animatedly outlines the Sabyinyo family in terms of which females Silverback male Guhonda got “jiggy jiggy” with. He teaches us how to communicate with Gorillas, from a calming low grumble to a greeting—“Mah-mmmmm”—that sounds like a drunken Wookiee. 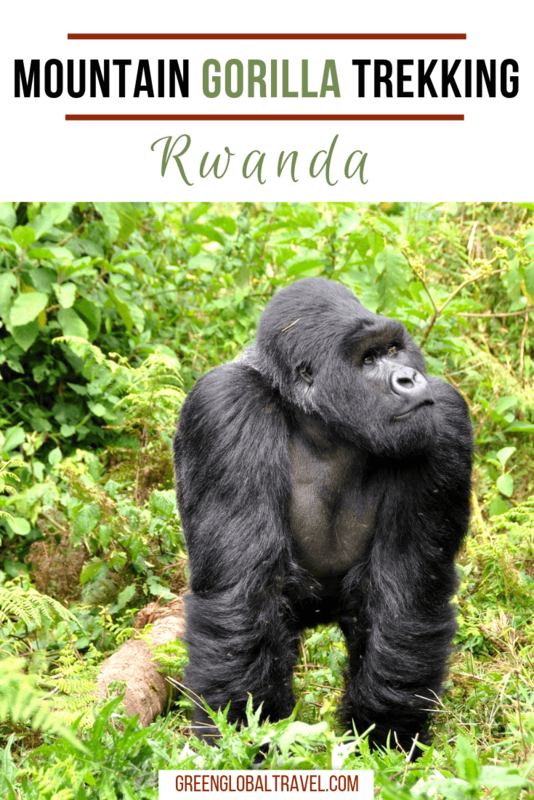 When he talks about plants Mountain Gorillas feed on—including fresh bamboo, gallium vines, and wild celery—he eats them himself, and encourages us to do the same. 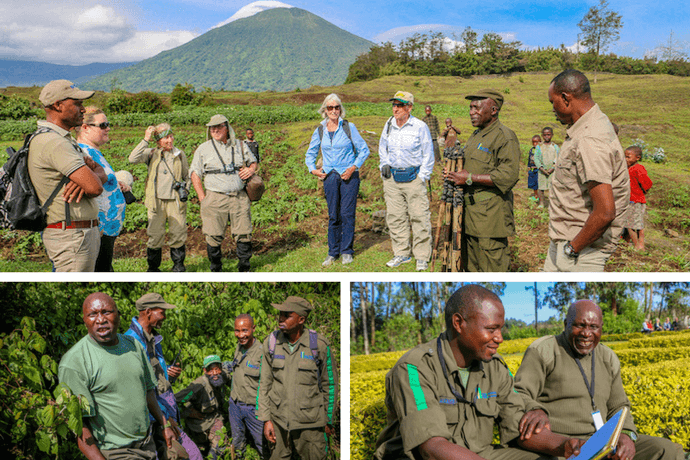 With 10 habituated groups and only 8 hikers allowed per tour (to minimize negative impact), there are just 80 permits issued to see the Mountain Gorillas of Rwanda each day. 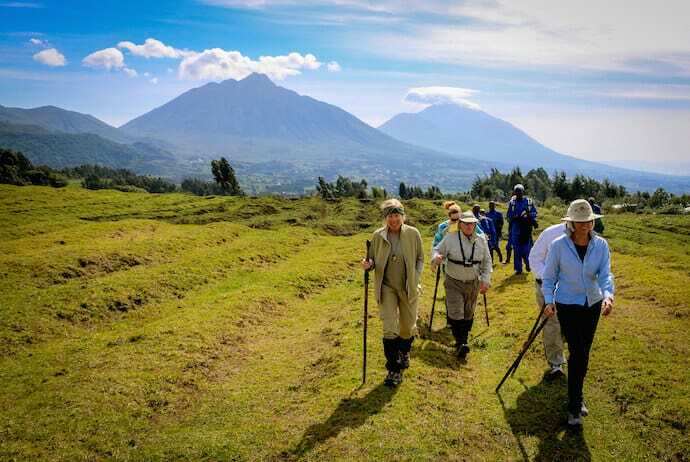 Foreign trekkers pay $750 to spend an hour with the Gorillas, generating over $15 million annually. In keeping with the ecotourism ethos, much of that is used to hire local guides and fund conservation efforts. We begin the tour with an orientation, learning about the rules of Gorilla encounters. Most of them are obvious– no eating around the animals, minimize noise, no flash photography, and keep a minimum distance of 20 feet. 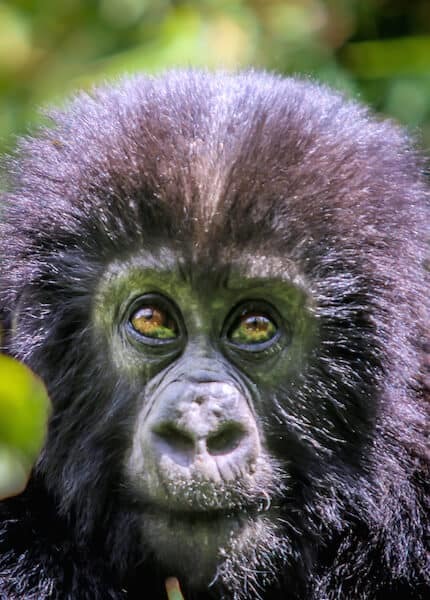 It’s also important to avoid eye contact with the silverbacks, and avoid imitating behaviors (such as beating your chest) that could be perceived as aggressive. The Sabyinyo group is the closest and easiest to track family in Volcanoes National Park. They’re found on the hills between Mt. Sabyinyo and Mt. Gahinga. Its alpha male, Guhonda, is the largest silverback in Volcanoes National Park, weighing in at a whopping 485 pounds! His family includes four breeding females, numerous fully-grown offspring, and at least three babies. We started our hike through beautiful fields of Pyrethrum flowers, one of Rwanda’s most important exports. After climbing over the park’s stone wall boundary, we began making our way up the mountain through bamboo forest and choked undergrowth. Francois made frequent stops, allowing us to rest and rehydrate. But still it took us just an hour to reach the Gorillas: Some treks can take three hours or more each way. It’s impossible to describe the adrenaline-charged feeling of standing near a family of Mountain Gorillas in Rwanda. The experience is a rollicking rollercoaster ride of emotions– anticipation, intimidation, elation, awe. From the moment we turn the corner to see mama Karema and her baby, Urukuta, feeding at eye-level, time seems to go into hyperdrive. While visitors are expected to keep their distance, Gorillas don’t give a damn about rules. As we stand in a 6-foot diameter circular clearing, Urukuta’s wide-eyed curiosity brings him within 10 feet of my face. Hearing a snapping branch to my right, I move out of the way just as Big Ben (an adult Gorilla with male-pattern baldness) uses a tree branch to descend and executes a perfect somersault right where I was just standing. Several times the Gorillas walk so close to us that we have to lean into the surrounding vegetation to avoid them. One woman, whose back was turned as a female approached, got a gentle touch on her shoulder as if to say, “Coming through!” I could’ve watched for hours as Guhonda calmly fed on bamboo leaves, his sharp, dirty teeth offset by gleaming pink gums. Nearing the end of our hour, Francoise leads us into the undergrowth, where we’re surprised to see see Guhonda, his mates, and several offspring settling down for an early afternoon nap. Karema cradles Urukuta in her arms, as young Agasozi rests on the soft, fragrant earth. The forest is virtually silent and still as we take our last few minutes to soak it all in. 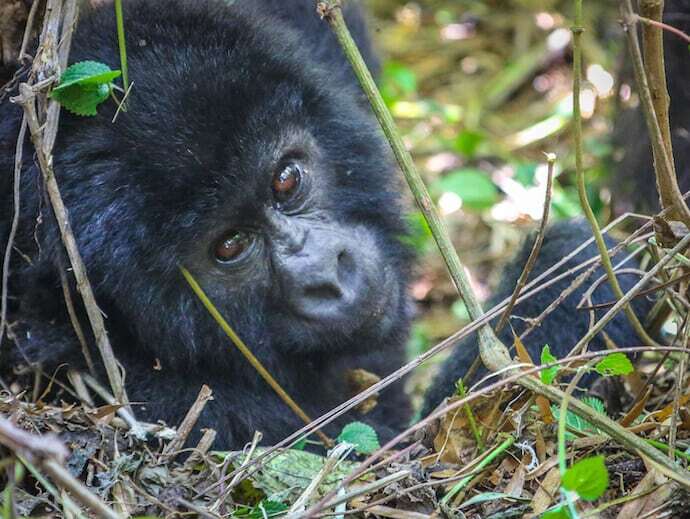 Our mountain gorilla trekking experience Rwanda was hosted by the Rwanda Development Board and Thousand Hills Expeditions. But we will never compromise our obligation to our readers. Our opinions remain our own.